NASA’s Cassini Spacecraft will begin a series of three close encounters with Saturn’s moon Enceladus starting Wednesday, October 14. New images are expected to begin arriving one to two days after the flyby, providing the first opportunity for a close-up look at the north polar region of Enceladus. The October 14 encounter will serve as a prelude to the main event, a flyby of Enceladus on Wednesday, October 28, during which Cassini will come dizzyingly close to the icy moon, passing a mere 30 miles (49 kilometers) above the moon’s south polar region. 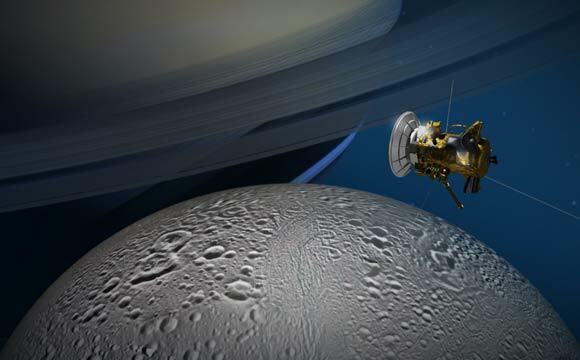 During this encounter, Cassini will make its deepest-ever dive through the moon’s plume of icy spray, collecting images and valuable data about what’s going on beneath the frozen surface. Cassini scientists are hopeful data from that flyby will provide evidence of how much hydrothermal activity is occurring in the moon’s ocean, and how the amount of activity impacts the habitability of Enceladus’ ocean. Cassini’s final close flyby on December 19 will examine how much heat is coming from the moon’s interior from an altitude of 3,106 miles (4,999 kilometers). 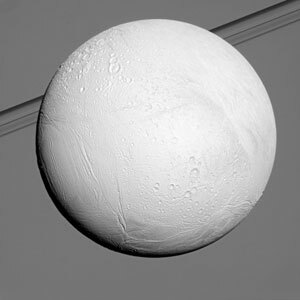 Be the first to comment on "Cassini Spacecraft to Begin Flyby of Saturn’s Moon Enceladus"